"LEGENDS OF HIP HOP describes a project that includes more than 35 hiphop legends from the first hour veterans to the recent stars. It includes names like Bambaataa, Melle Mel, Grandmaster Flash, Kurtis Blow, Ice-T... just to mention a few. The album was based on an idea to connect rap and hiphop greats from both the old and new skool[sic.] scene into one big project. The highlight of the album is the track 'The Fifth Element' which is performmed[sic.] by 34 hiphop legends." That's the introduction to an album that I can't believe has somehow managed to be pretty much never written about. 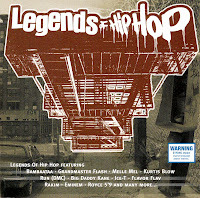 Legends of Hip Hop came out in 2002 on Absolut Records. Yes, like the vodka. A full-length album that features all original (well, almost... more on that later) material by such great big names in hip-hop that somehow managed to fly completely under the radar? How? Why? Well, the album was put together by Kurtis Blow, in association with his Legends of Hip Hip old school tours. Blow co-produced all the music on this album with two guys named Informer and DJ Buck. They utilize a lot of live instrumentation, too... the liner notes credit musicians for guitars, trumpets, sax, a couple of violins and a viola. So, how is it? What exactly do we have here? Ok, let's start with the "highlight of the album" (according to the liner notes quoted above... I actually disagree), the mega-posse cut "The Fifth Element." 34 hip-hop legends. That's pretty impressive, right? And the actual list will probably impress you more: Melle Mel, Ice-T, Flava Flav, Cheeks, Special K, Bambaataa, Run, Smooth Approach, Sha-Rock, Doc Ice, Busy Bee, Whodini, Raheem, Reggie Reg, Grandmaster Caz, DLB, LA Sunshine, Grand Puba, Pete DJ Jones, Kurtis Blow, Hollywood, Eddie Cheeba, Big Daddy Kane, Dano, Ceelo (as in Goodie Mob, yeah), Waterbed Kev, Speech, Kidd Creole, Grand Wizard Theodore, Dota Rock, Rakim & DJ Kool Herc. That's not a bunch of nobodies peppered with a few names, that's an incredible assembly of an all-star line-up! ...But, wait. The song's only four minutes long. And it's got a recurring hook, which takes up almost 50% of the song. And, half those guys are DJs, how do they rap on this track? "Ya owe it to yourself; get your education." ...That was it. That was the entirety of his contribution. And his was longer than a lot of the others! So, yeah. They call it the "highlight of the album." They even include two mixes on here, the original and "Beathoavenz RMX," which liberally samples some Beethoven. I call it a big, fat "who cares?" But the rest of the album is much more interesting. Most (plus a few other dudes) of the artists featured on that silly posse cut turn up again on this album to perform all new songs. Most are collaborations you've never seen happen before and are pretty interesting. Raheem, Grandmaster Caz and Shinehead provide a song called "Be 4," Ice-T, Chilli Mac and Rakim perform "Game of Life," Reggie Reg, Skeeta Ranks, Jalil, Ecstasy and Doc Ice do "Shake Them Hips," etc. Here we actually get to hear these artists get a chance to do something! Just for the record, the other artists who turn up on this album are: Thug Nation, Kurupt, Harry Balz (don't know who that is? He's the other half of One and One, who we last heard from on Next Plateau Records in 1997! ), The Ying Yang Twins, Steph Lova, T.O.P., GQ, and Lovebug Starski. So, how are these songs? Well, they're varied... there's some nice lyrical performances, a variety of concepts and a good mix of styles. The production team of Blow, Informer and Buck I'm sure doesn't have you at the edge of your seat, but they're at least attempting something creatively different that's still got a traditional hip-hop vibe. It's not a great album, but guys like Ice-T, Melle, Sha-Rock, Kane, and others do drop some head-nodding verses. Flava Flav provides an amusingly bugged hook to "Old School Ball," with a faux British accent. The live instrumentation helps keep things interesting and some songs have nice cuts, too. It's a mixed bag, certainly; but a lot of this is really better than you jaded vets would expect. To add to that mixed bag feeling, though, we have to address why Eminem and Royce da 5'9's names are on the cover. Well, "Nuttin To Do" by Bad Meets Evil is on here. Yes, the song from their '98 12" in Game Recordings. Why? I dunno. More interestingly, though, is "Bad Meets Evil - New Shrooms Mix." Yeah, Blow and team actually do their own, exclusive remix of the song from the Slim Shady LP. It's, uh... yeah, it's pretty corny. But except for those two tracks and one other - this album also features Justine Simmons' dance tune "Praise My DJ's" featuring Run that originally dropped in 2000 - this is all new, original material, reminiscent of the noteworthy Raiders Of the Lost Art compilation released in 1994. 1) A 12" release of "The Fifth Element," which includes the original version and the Beathoavenz Remix version that's featured on this disc, as well as four more remixes (specifically: Sleepwalker Remix, Efe & Leeroy Remix, Nasty Remix and the Double Remix). Interesting, but I never picked this up, because frankly changing the beat wouldn't fix what's wrong with this song. 2) Another, completely unrelated hip-hop compilation called Legends of Hip Hop, which is just a generic collection of songs by 2 Live Crew, Ice-T and The World Class Wreckin' Crew on a label called Blue Dolphin. They're entirely unrelated save for the coincidentally matching title, so you can go ahead and disregard it... just be careful if you're ordering online that you know which one you're getting. 3) A 2-disc version that was released in Europe. Disc 1 is essentially the same as the US version, except it's missing the Bad Meets Evil remix, and instead features the Sleepwalker Remix of "Fifth Element" (from the 12" above). The second disc is then just another generic compilation of pre-existing hip-hop songs, this time basically a greatest hits of rap, featuring stuff like "Express Yourself" by NWA and "Summertime" by DJ Jazzy Jeff and The Fresh Prince. Personally, I'd stick with the single-disc US version, since it has the exclusive Bad Meets Evil remix, and if you really want the "Fifth Element," remix you could get the 12". So, yeah. It's not a great album, but it has some worthwhile material. And with all the talent involved, it deserves at least to be talked about.